View More In Breast Pump Accessories - Page 7. The flybold breast pump bag has been thoughtfully designed to meet the needs of the working-pumping-mama. The side pouches on either side store the breast pump, milk bottles, ice packs and pumping accessories. Both sides are thermally lined to keep milk cold for around 6 hours, depending on external temperature. Foam insulating material is sewn between the lining of the bag. Neatly organized with zippers, pouches and sleeves to store all else: Mobile phone, laptop, clutch purse, keys, books, cosmetics, watch, sunglasses, earphones and more! The compartments on either side carry a photo pouch, to insert a photo of your little one! ✔ SAFE. SOLID. 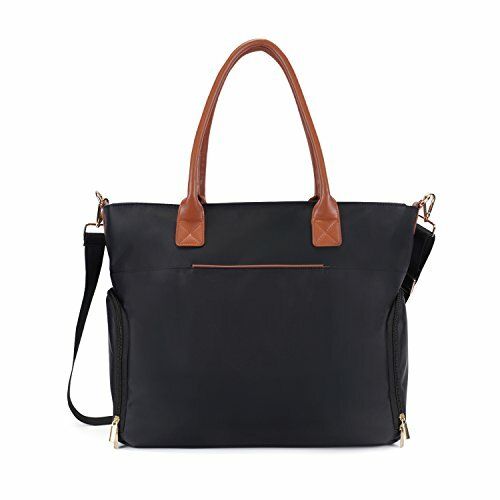 SUPERIOR Replace your many work bags with this one CARRYALL bag! A SOPHISTICATED DESIGN that SUITS THE WORKPLACE. THERMALLY LINED and FOAM padded, to carry milk and pumping accessories. STAYS FIRM and doesnt flop. STAGING MAT to layout accessories while expressing. PU CLAD HANDLES for style, carrying comfort. PADDED SHOULDER STRAP to comfortably carry heavy loads. ORGANIZED main compartment. BABY PHOTO POUCHES on either side. Smooth METAL ZIPPERS. ✔ STAGING MAT worth $15 INCLUDED to conveniently layout your pump and accessories while expressing. PHOTO POUCHES on either side, to hold the photo of your little one! ✔ ORGANIZED MAIN COMPARTMENT Neatly organized with zippers, pouches and sleeves to store all else: Mobile phone, laptop, clutch purse, keys, books, cosmetics, watch, sunglasses, earphones and more!